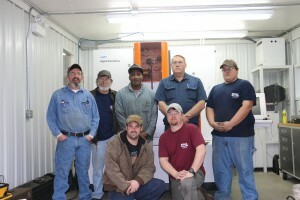 North Georgia Technical College very proudly nominated Stovall Machine Products, Inc., for the honor of 2015 Manufacturer of the Year in the small business category. Located in Lavonia, Dwight Stovall opened his shop 16 years ago and employs a small, highly skilled cadre of full time and part time employees. SMP is a full service machine shop with CNC, wire EDM gear cutting, and conventional machining equipment, with full service fabricating shop and mobile service. They service the automotive, textile, pharmaceutical, and other surrounding industries. The current shop which is 5,000 square feet will soon be expanded by an additional 8,000 square foot building allowing additional equipment and capacity. The new facility is expected to be fully operational by summer. SMP is connected to the community and is actively involved in the Franklin County Chamber of Commerce, Franklin County Education Committee, North Georgia Technical College, Future Farmers of America, 4-H Club, TriCounty Manufacturing Network, Lavonia First Baptist Church, and Hart Care Center. In 2014, Governor Nathan Deal issued a proclamation declaring April 14-18 as Manufacturing Appreciation Week, Gov. Deal noted the tremendous contribution manufacturing makes to the state’s economic well-being. More than 9,000 manufacturing facilities are located in Georgia, according to the proclamation, and they provide 351,910 jobs and generate more than $18.5 billion in wages in the state each year. For more information on Stovall Machine Products, Inc., visit http://stovallmachineproducts.com/. For more information on programs of study at NGTC, please contact 706-754-7700 or visit the website at www.northgatech.edu.